Full Name Edward McQuat . Children 1865 Janet b 21 Jul 1865 Straiton; Jessie? Edward McQuat was born in Johnstone, Dumfriesshire on 22nd January 1836. In 1865 he was working as a shepherd at Dalquhairn, near Barr in Ayrshire when he married Jane McWhirter at Kilhenzie, Maybole, Ayrshire . In 1881 Edward was a shepherd 3 miles south of Straiton, at Knockskae, where he lived with his family . 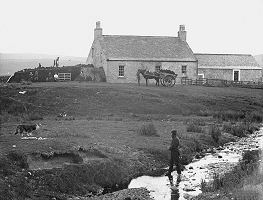 By 1891 he was still shepherding and he and his family had moved to a commodious 6-roomed house at Clawfin farm, 2 miles NE of Dalmellington . In 1901 at the age of 64, Edward was shepherding and living at Penbreck, a remote location in the hills 8 miles east of Cumnock, with his wife, 15-year-old daughter Christina, and another shepherd . 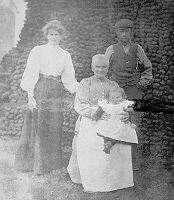 The family were photographed about this time at Penbreck (see below), though if the man is correctly identified as Edward, he is very young-looking for a 64-year-old. Penbreck. 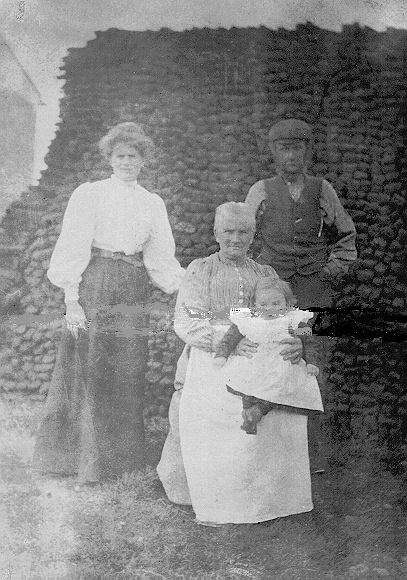 Edward's wife Jane with her grand-daughter, daughter and possibly Edward, Penbreck, 1901. Edward McQuat? in 1901. Edward McQuat died of accidental Carbolic Acid poisoning, on 4th December 1907 at the Railway Station, Sanquhar . Census  1841,  1871,  1881,  1891,  1901;  IGI;  GRO birth, marriage and death indexes;  McWh*rter Genealogy;  Baker genealogy;  Sarah Mehta.